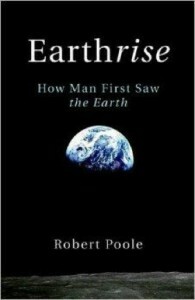 British historian Robert Robert Poole’s book, Earthrise: How Man First Saw the Earth, is an extraordinary account of two iconic photographs that captured the imagination of the whole world. On December 24, 1968, NASA’s Apollo 8 spacecraft sent two images to earth; one, the “Pale Blue Dot” made famous by Carl Sagan’s book by that name, and “Earthrise,” the cover picture of Poole’s book. The sight of earth rising over the moon was as majestic as it was humbling; the “pale blue dot” gave us a more accurate sense of how we fit into the cosmic order. It could no longer be assumed that earth was in any sense the center of the cosmos; these images demonstrated the fact that we occupy a very small planet in one corner of one galaxy among millions of other galaxies. Indeed, the pervading sense of kinship and fragility these photographs engendered fundamentally changed the way people saw themselves in relationship to one another. It was no longer possible for reflective people to consider their internecine warfare and tribal allegiances rational; the planet on which those conflicts play out is just too small, vulnerable, fragile. This sentiment was captured ideally in the following poetic essay from Carl Sagan’s Pale Blue Dot: A Vision of the Human Future in Space. Sagan was a visionary with great poetic imagination as well as a groundbreaking scientist. His words have clear implications for the human species: We are clearly a single family; attempts to divide us by race, class, religion and tribe are ultimately misbegotten. Poole’s book on this important object lesson for humanity is well worth the read.